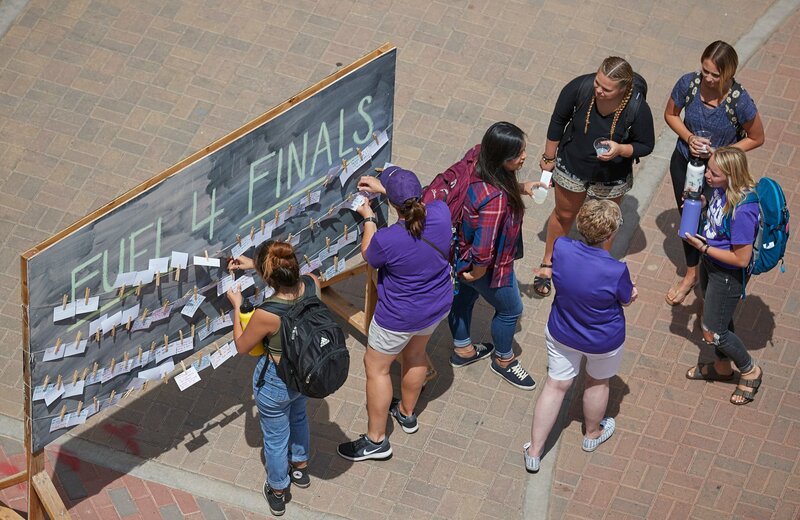 Students write their prayer requests on a note card and put it on a chalkboard at Grand Canyon University’s Fuel for Finals campus tradition. Stress. Marriage. Tests. Cancer. Moving. Friends. 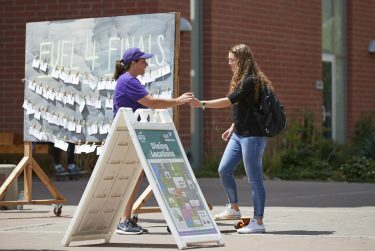 Those were just some of the prayer requests placed on dozens of parent volunteers Thursday at Grand Canyon University. “It feels so amazing to be able to acknowledge everything that goes on in our daily lives outside of school, too,” said Maia Huggett, a biology major. The event – Fuel for Finals, a campus tradition hosted by the Office of Student Engagement twice a year that invites students to take a break between studying and exams to enjoy treats, drinks and get some encouragement – was a joyous display of love and much needed prayer. 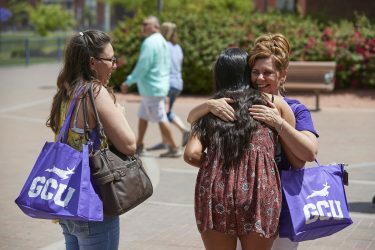 Fuel For Finals was an opportunity for parent volunteers to offer prayer remind students they are not alone. Volunteers were spread out on the Promenade and on the walkway to The Grove distributing Starbursts with scripture cards and lemonade. Students also could write a prayer request on a note card and put it on a chalkboard. Henderson’s parents, Sheri and Todd, took the day off to remind students that they are not alone. Said Sheri, “A quick prayer, a hug, a word of encouragement – that’s what we’ve seen here today.”. Students stopped by to pick up a snack and a few words of encouragement. He talked about his hope to get into the University, try out for the basketball team and the need to get his heart right with the Lord. “It was probably the sweetest moment I’ve had,” Sheri said. Lisa Kowalski, a returning volunteer, prayed for a student getting married in 89 days, a teacher conducting a social experiment and several graduating seniors. She was most excited to see familiar faces and to hear about the impact of their prayers. “Those of us who are here have a love for interceding for those who Christ loves, and it is encouraging to see and to hear that prayers were answered, healings came, answers came, blessings in abundance came and that is the greatest gift that we get,” said Kowalski. For Judy Clissold, the volunteering opportunity was a chance to spread joy on campus.